LeaderM8 - Easy to use. Most versatile Leader Line program available today. System requirements: Runs inside AutoCAD versions 2010 through 2017. LeaderM8 is a must have for any user no matter what the discipline of drafting. 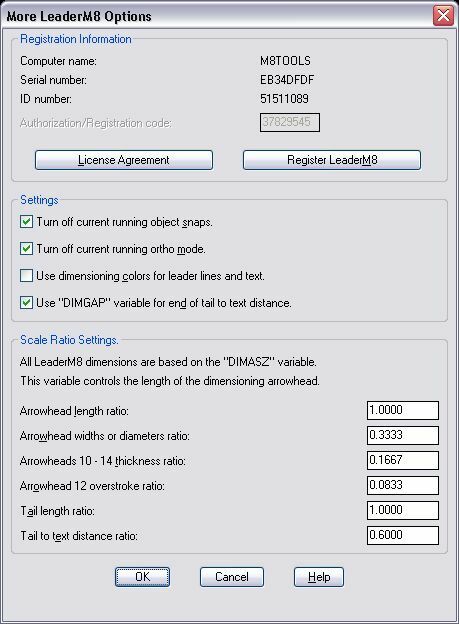 LeaderM8 has arrowhead and endings features that can be used in architectural, engineering, civil, mechanical and others. LeaderM8 has a deep feature set and is highly customizable, you can save or setup options that suit your particular needs. LeaderM8 sizes it leader features from those of AutoCAD's leader settings. LeaderM8 has many options, one handy one is the ability to import text into a note. If you draw a lot of assembly details, we have an auto numbering feature for our bubble endings. By using various feature settings you can create over 8000 different styles of leader lines. Why do you need this program. Because it's so simple to use and setup. With simple point and clicks you can create a leader line that suits your needs. Seat License are U.S.$35.00 each. To register: Select the number of seats you wish to license then pick the PayPal buy now button, you will then be redirected to the PayPal site for payment processing. The user has a choice of 31 arrowheads and 20 endings, plus they can change its mode of execution. The user has the ability to import text into the multi-line text endings, automatic numbering for bubble endings, multi-segment or single-segment leader lines, arced or straight lines, whether or not to add a tail to the end of the leader line. The user can save and retrieve leader line styles. LeaderM8 creates most of its leader lines out of a single polyline. When a user has to make revisions to a drawing, they only need pick one line versus many lines, be it copying, erasing, moving or whatever editing they need to do to it. Type CC to start with curved leader lines or LL to start with straight leader lines. Setup Arrowhead, Ending, or other options (see below). Pull the arrowheads rotation angle. LeaderM8 will then draw an arrowhead. You can then add your Arc and/or Line segments. LeaderM8 will then ask for an angle for the Tail and Endings placement. The program will then turn orthomode on, so angles at 0, 90, 180, or 270 degrees will be an easier choice. You don't have to use orthomode, you can turn it off and use any angle that will suit your needs. You can also enter in your angle from the keyboard. LeaderM8 will then allow you to enter in text. After you've entered in your text, press Return. LeaderM8 will now repeat itself and allow you to create another leader line, or press Return to exit program. Following are commands available from the LeaderM8 command line. Arrows: Allows the selection of 31 different arrowhead types by entering in its corresponding number. Above text ending: Places a line beneath the full length of your entered text string. Arc toggle: Sets up LeaderM8 to use curved lines instead of straight lines when adding leader line segment(s). Arrows: Allows the selection of 31 different arrowhead types by picking via the arrow selection dialog box. Auto numbering toggle: Sets up LeaderM8 to use auto numbering in the Bubble Bndings. Box text ending: Adds a surrounding box around multi-line text to the end of the leader line. For explanation of multi-line text, see TExt. Circle text ending: Creates a circle bubble with text at its center to the end of the leader line. For auto numbering see Bubble Endings. Config: Brings up the configuration dialog box. Circular section text ending: Adds an circular section mark to end of leader line. Also prompts for section number text and sheet number text. Diamond text ending: Creates a diamond bubble with text at its center to the end of the leader line. For auto numbering see Bubble Endings. Diamond with Circle text ending: Creates a diamond-circle bubble with text at its center to the end of the leader line. For auto numbering see Bubble Endings. Elevation mark text ending: Creates a elevation mark at the end of entered text line. Ending: Allows the selection of 19 different ending types by picking via the ending selection dialog box. Elongated Section text ending: Adds an elongated section mark to end of leader line. This ending allows the user to add a section number and a sheet number. Text Exporting: Allows the user to select text that will be exported to a text file. By using this feature, the user would only need to write a complex note once. Then by using the Import feature, they could import it into a new multi-line text ending. Hexagon text ending: Creates a hexagon bubble with text at its center to the end of the leader line. For auto numbering see Bubble Endings. Text Importing: Allows the user to toggle the text file importation feature on or off. When toggled on, it allows the user to import a generic text file (*.txt), into any of the multi-line text endings. This will help the user who has to type a complex note many times in a drawing or in many different drawing files. The user will only need to type it once, then use the EXport option, and then use the Import option to import the text file into a new multi-line text ending. Line toggle: Sets up LeaderM8 to use straight lines instead of arced lines when adding leader line segment(s). List: Displays a list of available LeaderM8 command line options. User can also double click a listed command to have it activated. Multi-segment toggle: Toggles single or multi-segmented arc and/or line mode. When toggled on, LeaderM8 will create multi-segment arc and/or line segments. When toggled off, LeaderM8 will create a single-segment arc and/or line segment. Oval text ending: Creates a surrounding oval around a single line of entered text. Reverse text ending: Reverse justifies multi-line text that was added to the end of the leader line. For explanation of multi-line text, see TExt. Square with Circle text ending: Creates a square-circle bubble with text at its center to the end of the leader line. For auto numbering see Bubble Endings. Square with Diamond text ending: Creates a square-diamond bubble with text at its center to the end of the leader line. For auto numbering see Bubble Endings. Square text ending: Creates a square bubble with text at its center to the end of the leader line. For auto numbering see Bubble Endings. Tail toggle: Toggles add a tail to the end of leader line on or off. When toggled on, LeaderM8 will create a tail to the end of a leader line. When toggled off, LeaderM8 will create the endings at the end of the last arc and/or line segment. Text ending: Adds multi-line text to the end of leader line. This text will be left justified if the tail is pulled toward the right and right justified if the tail is pulled to the left. Triangle text ending: Creates a triangle bubble with text at its center to the end of the leader line. For auto numbering see Bubble Endings. Triangle with Circle text ending: Creates a triangle-circle bubble with text at its center to the end of the leader line. For auto numbering see Bubble Endings. Vertical text ending: Adds a vertical edge line to the multi-line text that was added to the end of the leader line. For explanation of multi-line text, see TExt.
? : Brings up this Help File. Hitting return allows the user to exit the program gracefully. Bubble Endings - When you choose a bubble ending, you'll be asked if you would like to use automated numbering. 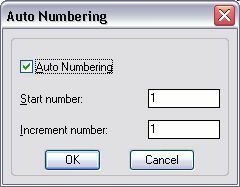 To use automated numbering, you will be prompted for a start number and the number to increment by. The LISt command from the LeaderM8 command line will bring up this List Command dialog box. This dialog box gives the user a quick reference to the available LeaderM8 command line options. The user can also select a listed command and pick OK or double click it to run that option. The "COnfig" command line option will bring up the configuration dialog box. 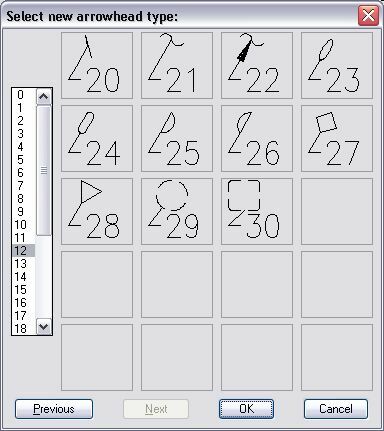 In this dialog box, you can select what type of arrowhead and ending you wish to use by clicking on the appropriate icon or scroll list. The arrowheads icon pops up the Arrowheads dialog box that allows you to pick the arrowhead type you want. Adjust the length of the arrowhead. Adjust the width of the arrowhead. Adjust the thickness for arrowheads 10 through 14. Adjust the overstroke distance for arrowhead 12. Adjust the angle for arrowheads 10 through 14. Pick type of segments you want to use. Toggle controls the users choice of either multiple segments or single segment leader lines. Toggle controls the users choice of either adding a tail to the end of the leader line or not. The endings icon pops up the Endings dialog box that allows you to select the ending that you need. Adjust the length of the tail. Adjust the distance from the tail to text. Toggle controls the automatic import of text into a multiline text ending. When enabled, it allows the user to import a saved text file (*.txt). Toggle controls the automatic numbering of balloon endings. 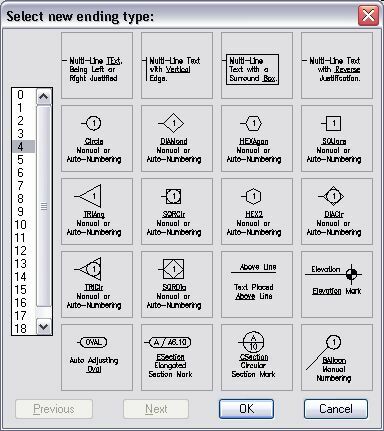 When enabled, it allows the user to have numbers automatically added to balloon endings with a user specified start number and increment number. The reset button will reset LeaderM8 with the defaults that were loaded when LeaderM8 was loaded. The styles button will bring up the Styles Dialog box that allows the user to either Delete, Overwrite, Rename, Save or Set Current the picked leader line style. Selecting the OK button will close down the dialog box, updating LeaderM8 to use your selections and settings. Selecting the Cancel button will close down the dialog box, the changes made in the dialog box will NOT be used. Your previous settings will remain intact. Selecting the Help button will bring up the help dialog box. The Styles button from the Config dialog box will bring up this dialog box. The user has the option of saving defined styles they have setup by entering a name in the "New Style name" edit box. Delete: Deletes the selected style. Overwrite: Saves the current LeaderM8 settings to the selected name. Rename: Renames the selected style. Set Current: Takes the selected style and applies its settings to be the current leader line style. This option will also close the styles dialog box and return the user back to the Config dialog box. OK and Cancel button will take the user back to the Config dialog box. Help will bring up this help file. 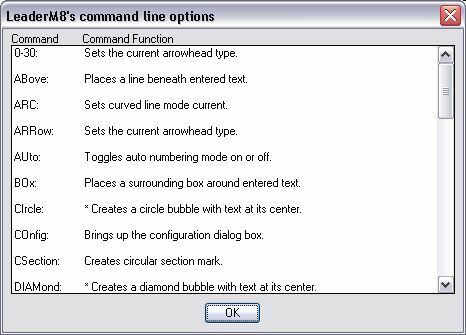 The arrowhead selection dialog box can be gotten to from a variety of ways, either from the Config dialog box, or from the ARRows command option. 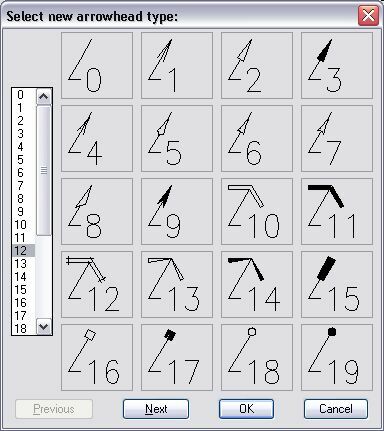 Arrowheads can be selected from either the scroll list, or by picking the desired image and clicking the OK button, or by double clicking the image. The next button will take the user to the 2nd arrowhead selection dialog box. Takes the users selected choice for an arrowhead and applies it to the current settings and returns the user to the Config dialog box. Returns the user to the Config dialog box. The Arrowhead 2 selection dialog box can be gotten to from arrowhead 1 dialog box. The previous button will take the user to the 1st arrowhead selection dialog box. The endings selection dialog box can be reached from a variety of ways, either from the Config dialog box, or from the ENding command option. Endings can be selected from either the scroll list, or by picking the desired image and clicking the OK button, or by double clicking the image. Takes the users selected choice for an ending and applies it to the current settings and returns the user to the Config dialog box. Upon selecting any of the bubble endings the user will be prompted for the auto numbering option. Web site link - Take the user to M8Tools.com's LeaderM8 page. License Agreement - Will bring up a window that displays the Licensing Agreement. Registration - Will bring up the Registration dialog box. OK - When the user picks OK, they will go back to the Main LeaderM8 dialog box. Selecting the Options button will bring up a dialog box that the user can use to setup scaling features of LeaderM8. The Authorization/Registration code entry box - After the user registers the software, M8Tools.com will supply the user with an unlock code. If an unlock code is not entered, the software will stop working approximately 30 days after installation. Turn off current running object snaps - If toggle is checked, it will turn off object snaps. Turn off current running ortho mode - If toggle is checked, it will turn off ortho mode. 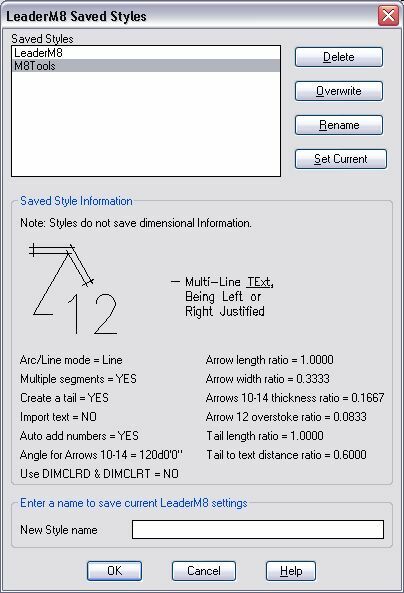 Use dimensioning colors for leader lines and text - If toggle is checked, it will create the leader lines and text using the colors used by the current dimensions. 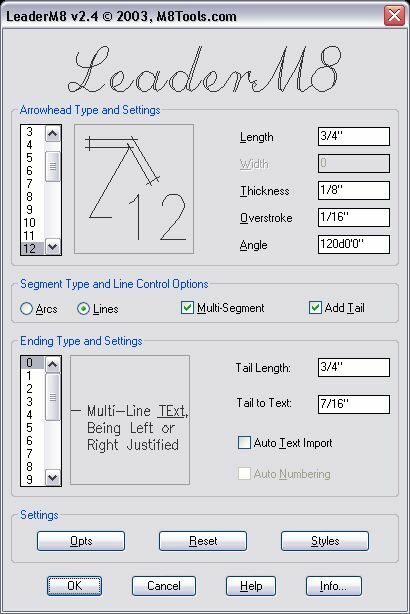 Use "DIMGAP" variable for end of tail to text distance - Uses AutoCAD's DIMGAP system variable to control the distance from the end of the leader line tail to the start of the text ending. Arrowhead length ratio - Scales the arrowhead size against the DIMASZ (dimension arrowhead size). Arrowhead widths or diameter ratio - Scales arrowhead width against the arrowhead length. Arrowheads 10 - 14 thickness ratio - Scales arrowheads 10 - 14 thickness against the arrowhead length. Tail length ratio - Scales the length of the leader line tail by the arrowhead length. Tail to text distance ratio - Scales tail to text distance against the dimension variable DIMGAP. OK - When the user picks OK, they will go back to the LeaderM8 Config dialog box. 1a) Send the above Registration Info along with User Info and payment in U.S. Funds via regular postal mail. 1b) I have paid the registration fee and I just need to send the above Registration Info and User Info via email. 1c) Send the above Registration Info via a live Internet connection and pay with a credit card. 1d) I just need to add the above Registration Info to the LeaderM8-Registration.txt file to be mailed later. If the user picks the first or second option then they need to fill out User Info fields. If the user wishes to register online, then they can pick the third option. 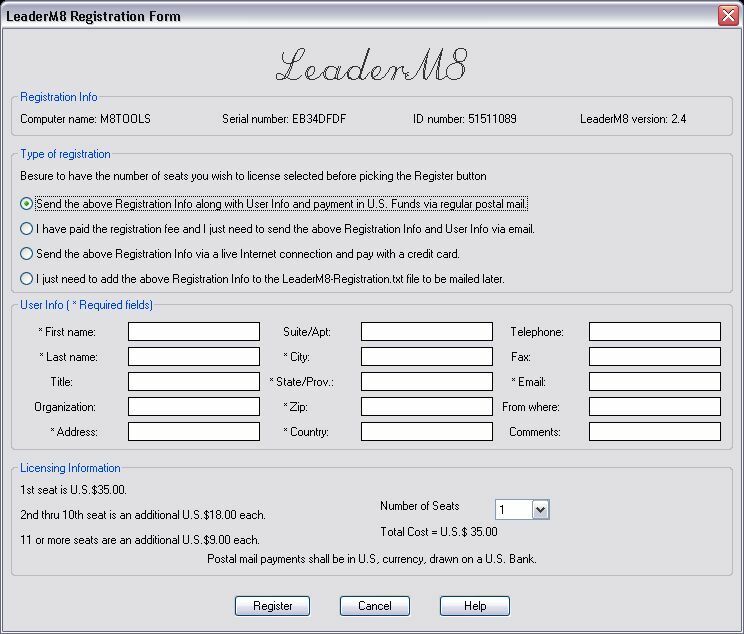 If a registration form has already been filled out, the user can append LeaderM8's Serial and ID Numbers from other computers to the end of the registration file "LEADERM8-REGISTRATION.TXT". Pick the number of seats you wish to register by picking the popup "Number of Seats", the total amount due will be displayed below the "Numbers of Seats" popup. To register, pick the "Register" button. If your are using the Internet to register, you will be directed to the PayPal web site for payment, then you will be directed to our online web registration page to complete the registration process. If you filled out the User Info form you will be asked to either accept the default file name or save the file "LEADERM8-REGISTRATION.TXT" to a desired location. Once this file is saved, it can be printed, emailed, mailed or have other Serial and ID numbers appended to it. When the user picks OPEN button from the save file dialog box, the registration file will be saved and the user is taken back to the Info or Config dialog box. Once the registration info has been filled in and the number of seats to register selected, and all the Serial and ID numbers appended to it, it can be sent either postal mail or email. For email send the "LEADERM8-REGISTRATION.TXT" text file to the email address . Upon receipt of registration information and payment, M8Tools.com will generate the required unlock codes and forward them to you either via email or mail. U.S. and international copyright laws protect LeaderM8. Its use is subject to the terms of the license agreement listed below. By using, copying, transmitting, distributing or installing this software (LeaderM8), you (the user) agree to all of the terms of this License. 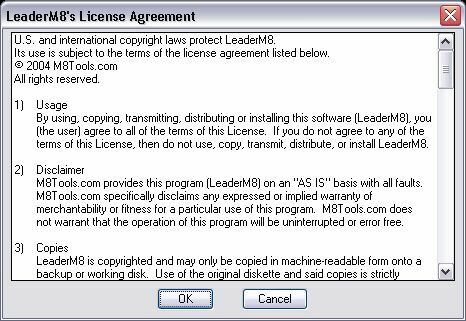 If you do not agree to any of the terms of this License, then do not use, copy, transmit, distribute, or install LeaderM8. M8Tools.com provides this program (LeaderM8) on an "AS IS" basis with all faults. M8Tools.com specifically disclaims any expressed or implied warranty of merchantability or fitness for a particular use of this program. M8Tools.com does not warrant that the operation of this program will be uninterrupted or error free. LeaderM8 is copyrighted and may only be copied in machine-readable form onto a backup or working disk. Use of the original diskette and said copies is strictly limited to a single computer system on which one or more users run LeaderM8. Copies of LeaderM8 may be shared with others as defined in the "Shareware - Software Sharing Method" described below, as long as all the source code and support files remain unmodified. No part of the program, documentation or support files may be reproduced in any manner without the express written consent of either the software author or an authorized representative of M8Tools.com. 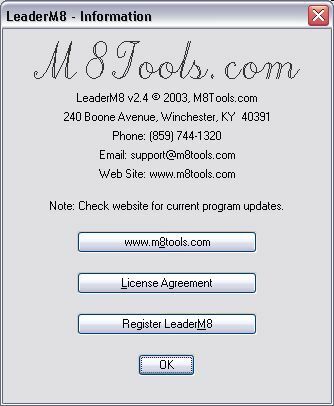 M8Tools.com will provide one free upgrade of LeaderM8, for all new registered users, when and if one becomes available. This Software requires an Authorization/Registration code. You must register this software product with M8Tools.com before an authorization code can be issued to you. Each installed copy is branded with a serial number that is unique only to the computer it is installed on. The serial number needs to be included with the registration of the software, so the author or a representative of M8Tools.com can supply an authorization code. The purpose of the authorization code is to protect the authors copyright and enforce the license agreement. If an authorization code is not obtained the software will stop working approximately 30 days after installation. Site Licenses don't require the use of Authorization codes. Should the need ever arise to transfer LeaderM8 to another computer, a new authorization code will be needed. There will be one free transfer per year per seat license after an initial period of 90 days from the registration date. Should more than one transfer per year be required (per seat) a fee of U.S.$5.00 will be required for the generation of new authorization codes. By transferring licenses, the old serial number will become retired and thus inactive. If a user wishes to reinstall LeaderM8 on that computer they will need acquire a new license or retire another licensed copy of LeaderM8. If registered users wish to acquire new licenses, they can be purchased for the price entry point they last purchased the software. Please contact for transfer information. Site Licenses have unlimited transfers. You are free to distribute the shareware version to others to try as long as all the source code and support files remain unmodified. This excludes the registration file (LEADERM8-REGISTRATION.TXT), which you are free to edit, so you may mail along with your registration fee, if you choose. You are free to try LeaderM8 for a period of ten (10) days. THEN YOU SHOULD REGISTER IT. By doing so you will allow the author to spend the time upgrading and making enhancements to this and other utilities in the future. If you don't find it useful then remove LeaderM8 and all related support files from your system. BY REGISTERING YOU WON'T FEEL GUILTY AND YOU'LL BE SUPPORTING ANY FUTURE DEVELOPMENT. Shareware is a method of software distribution. M8Tools.com hopes you find shareware to be an effective method of obtaining computer programs. The term Shareware describes a marketing method in which copyrighted programs circulate freely among users for the purpose of evaluation. This gives you the option to "Try Before You Buy". The author of a shareware program typically allows you to use the program for a number of specified days before payment is required. The exact terms of evaluation vary from author to author. So be sure to always check the documentation of the programs you evaluate. By making payment to the author, you obtain the legal right to use the software, and encourage the continued development of quality software within the shareware channel. The process of paying for Shareware is termed "Registration". The exact benefits of registration vary from author to author, but many authors will offer one or more of the following: a current version, technical support, a printed manual, free or discounted upgrades, bonus utilities, and/or special offers. So always consult the registration information included with each shareware program. Site License packages are available with licensing of 15 or more seats. Benefits: No individual machine registration information to keep track of (Computer Names, Serial Numbers, ID Numbers and Authorization Codes) that is needed to unlock our shareware software versions of AutoM8, BatchM8, LeaderM8, PlotM8 and RecoverM8. Contact M8Tools.com for more information.